Intended for use by providers, educators, and other PNC stakeholders, these job aids are intended to support adherence to WHO guidelines for high-quality, evidence-based pre-discharge postnatal care, to help providers recognize danger signs in mothers and newborns, and to remind providers of key health interventions to promote best practices for mothers and families. The checklist (English | Spanish) is designed to be a simple, user-friendly bedside tool to help health care workers provide efficient, integrated, high-impact care for the mother-baby dyad. Health care workers can use the checklist as a visual aid or client record when caring for women and newborns. 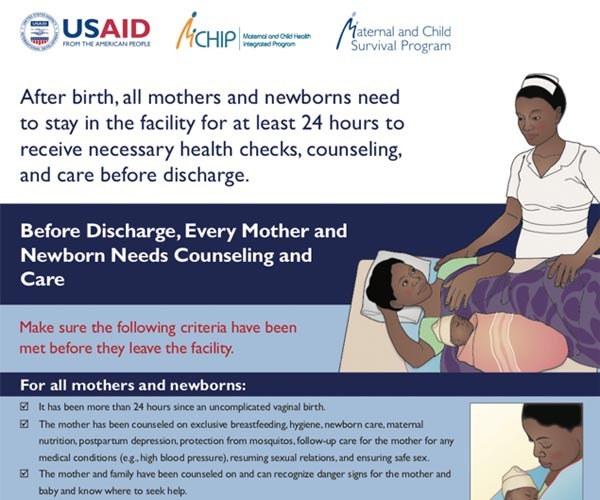 The poster (English | Spanish) serves as a prompt for essential PNC interventions for providers as well as for women and their families, and is intended for display in facility postnatal care units. Both products are intended for use as job aids for health providers who interact with a mother-baby dyad before discharge from a postnatal care ward. You can also find these resources on MCSP¹s website.